The objective is to obtain a 40-year hindcast of wind, wave, sea-level and current climatology for European waters and coastal seas for application in coastal and environmental decision processes. The initial work is to produce the atmospheric data that will serve as forcing to the circulation and wave models. To describe the small-scale atmospheric response three regional climate models will be forced with the large scale 40 years NCEP-reanalysis. 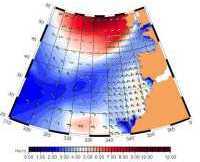 The data are provided on a 50 x 50 km grid and will be used in the project to force the wave and ocean models.